Plants have been a prominent feature of interior design for centuries. They make spaces more inviting, bring that all-important organic quality to a room and are all the rage! There are so many ways to incorporate plants into a design so they enhance the objects around them. Okay, you may be thinking, I’m not a green thumb. It’s okay, we’re not either! Others of you may be thinking — I’ve been there, done that…. with the old dusty ficus tree or the overdone floral arrangement as the table centerpiece – both of which landed in the spring garage sale! Take a look at these images and see how you can rethink your indoor plants in a fresh new way! Try adding some permanent “faux” greenery — think palms, ferns, grasses or even a bamboo plant. Add a colorful, bright orchid (fresh or faux) to your cocktail table, or place an interesting succulent on top of a stack of books on a bookshelf. Trees and taller plants can be great solutions if you are looking to add height to a room or fill an awkward space. You can never go wrong with fresh flowers from your garden (or in our case, supermarket!) Just remember to keep the water fresh, cut stems at an angle and remove all the leaves below the water line. We like to think of this look as “Tropical Glam”. 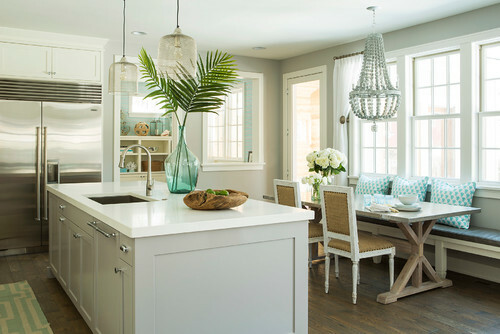 Palm fronds definitely add a fresh statement to a room. Adding a few stems to a decorative glass vase with narrow opening is a great accessory for a bright interior. Nothing says “Welcome” like a beautiful orchid. Add a touch of garden-inspired elegance to your decor. This “pop-of-pink” brings interest to an otherwise neutral room. Fresh flowers are a quick way to add color and life to a space that otherwise lacks warmth. Especially in a kitchen this fabulous. 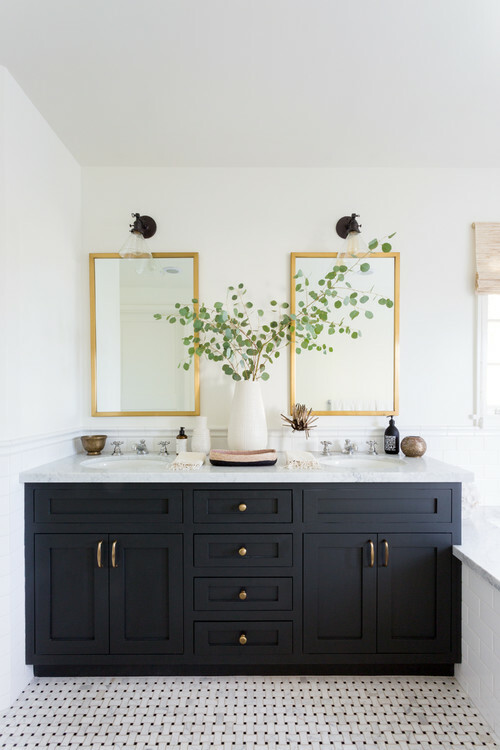 We love seeing greenery in any room, even the bathroom. Not only is it simple and effective, it’s a way to connect with the outdoors. We invite you to check out our Website, like our Facebook Page and follow us on Houzz for more design inspiration. 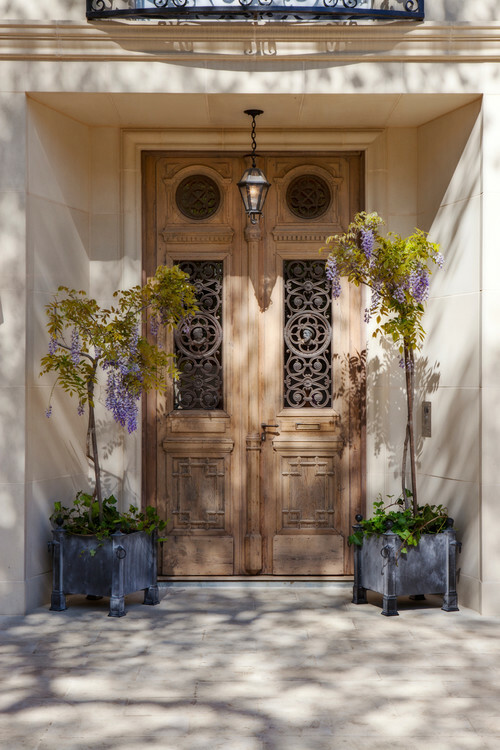 Is Your Front Entry In Need Of A Spruce Up? What better way is there to make your home more appealing than to spruce up the front entryway? Start with a charming welcome mat and a fresh coat of trendy paint on the front door to give your home instant curb appeal and make it inviting to all. Then, add life and color with beautiful planters overflowing with a variety of annuals or keep it simple with a classic topiary. These simple changes will definitely put a smile on your face and a “spring” in your step. 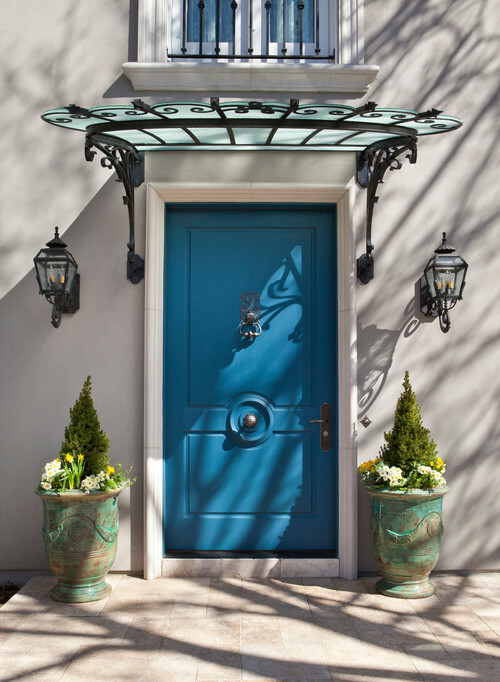 There is no feeling “blue” when you look at this front door. We love the fan-shaped glass and iron scrolled awning above. Makes us curious as to how beautiful the inside of this home must be. Don’t forget to add a doormat to your entry! They not only serve a important functional purpose of trapping the dirt outside, but also adds a stylish addition to the front door and porch area. Leave your boots on the mat! Creative Solutions for Challenging Windows; Reimagine Your Window Treatments! There are limitless applications including high, clerestory or odd shaped windows, transoms, niches or recessed wall areas, exterior areas, doors, sidelights, ceilings, wall décor, screens/dividers, headboards, cabinet door accents and more. Each piece is custom built to fit any size or shape project. These grilles are lightweight, cost-effective and nonstructural. You can choose from multiple patterns or custom design your own pattern, and select a variety of finishes to enhance any color palette for both interior and exterior spaces. Many of our clients have these transom style window configurations. 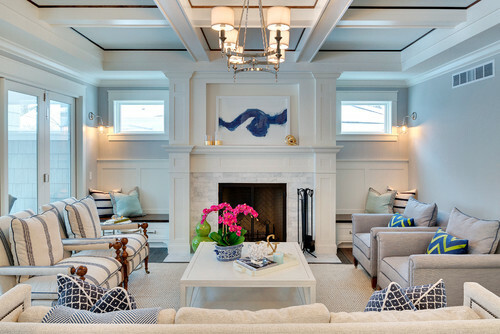 It is the perfect addition to this transitional family room. Pantone announced its color of the year, and it’s Ultra Violet! Now, Ultra Violet may evoke images of bold bright color like the image below, but don’t let that deter you from the trend, if bold color isn’t your thing. Your use of color may vary greatly and depends on your personal preference. In the next image, you can see the subtle nod to the Ultra Violet trend in the paint color. The otherwise neutral furnishings in this “vignette” tones down the violet. In this final example, the use of purple is more deliberate, and the varying hues ranging from lavender to violet to deep plum help bring depth and dimension to the room. The darker plum euro pillow shams help to ground the space, and define this luxurious bed. 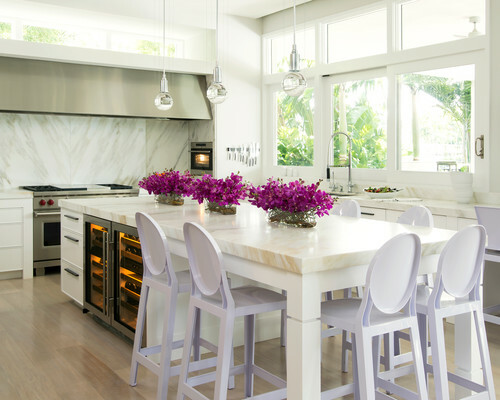 There are numerous ways to add Ultra Violet to your space. Whether it’s throw pillows or a soft throw blanket, art, accessories, cut flowers from the garden, lamps, or in an area rug, you can introduce the color as subtly or as boldly as you like. Don’t be afraid of color, sometimes it’s what a bland room is missing. If you haven’t already subscribed to our monthly e-article, drop down to enter your e-mail address and be inspired! You can also find us on Facebook and Houzz! Greetings from Pamela Neel Interiors! We are excited to share our first Be Inspired blog post. Our goal is to inspire you, share helpful tips, and keep you up-to-date with industry trends as well as what’s happening here at PNI. There is no shortage of inspiration out there, websites like Pinterest and Houzz, decorating sites and blogs, magazines, etc. are full of beautiful and inspiring ideas. But inspiration can literally come from anywhere; art, fashion, architecture, nature, travel, food, people. If it’s around us, it can inspire us.